We have recently acquired exclusive hunting rights on a large private ranch in the Santa Fe National Forest. In addition to it`s awesome scenery, this ranch is very well known in the area for an abundance of elk, mule deer, bear, cougar and turkey. This is a very limited opportunity as only a very few permits are available. Our camps consist of either cabins or wall tents heated with wood burning sheep-herder stoves, cots with foam pads to sleep on, and a portable shower for extended trips. 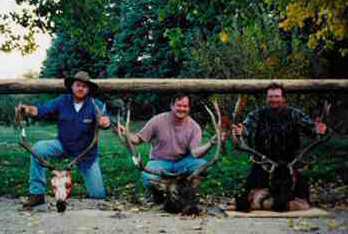 Hunting private land in New Mexico has some definite advantages over hunting public lands. Besides "having the mountain all to yourself," one of the main advantages is that tags for elk and mule deer are guaranteed and therefore you do not need to take your chances in the public lottery. This factor alone is very valuable to the hunter who wants to make plans to hunt in the same year and not have to depend on drawing a tag. Another very important factor is the length of time allocated for use of these private land elk tags. Private land elk seasons are very liberal. 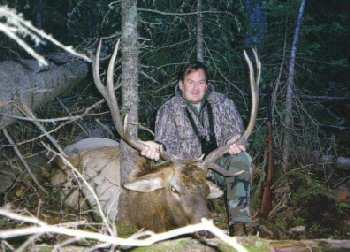 For example, bow elk tags are good from Sept. 1-22, Muzzleloader elk tags can be used during any five day period between Oct. 1-Dec. 31 and rifle elk tags can be used during any five day period from Oct. 8-Dec. 31, 2005. As a result of these liberal time periods, we can offer combination elk/mule deer hunts which can not be done on public land. Please call us for specific details. Two on one guide service. Private land permits and trespass fees. All transportation during the hunt. Transport of cape and trophy to a taxidermist in Santa Fe. Taxidermy and meat processing fees. Transportation to and from the ranch. COST: Please Contact Us For Pricing.